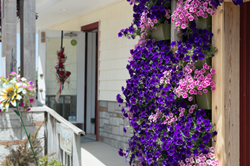 A new LiveWall living wall system was unveiled at Wasserman’s Flowers & Gifts, Muskegon’s oldest business and Michigan Floral Association’s 2016 Florist of the Year. The living wall was installed and planted earlier this month. The 8’ tall living wall was constructed with the LiveWall® system from LiveWall, LLC, the green wall subsidiary of Hortech, Inc., Spring Lake, Mich. The planted wall faces Vanderlinde Street where visitors entering the shop pass it on the route from the parking lot to the main entrance. Currently, the wall features a blend of pink and purple wave petunias. In 2013, siblings Troy Wasserman and Angie Nelund purchased the business from their father, Dennis Wasserman, and took over as the fifth generation to run the flower shop. As the new owners of a business which has operated since 1880, they looked for ways to refresh the shop and add appeal for all ages. In addition to seeking out new, unusual, and hard-to-find gift items, the Wassermans renovated to modernize the building and make it more inviting to tourists and local residents. Renovations included a landscaped patio complete with porch swing, shaded seating areas, and the living wall. “We envisioned a living wall to complement the addition of exterior black and white prints that highlight our rich history of quality and service in this community,” said Troy Wasserman. “The site shows the different sides of our business which tie into the different sides of West Michigan. The gray stucco shows our industrial side, while the stone and woodwork show the craftsman side, and the living wall organically connects them.” he explained. Dave MacKenzie, president of Hortech and LiveWall, assisted Wasserman’s in planning the green wall installation for the flower shop. Troy Wasserman approached MacKenzie after disappointment in performance of an alternate living wall system, which did not sustain the plants as expected. Ultimately, Wasserman chose to dispose of the other system, and then invested in the locally manufactured and grown LiveWall system for its ease of planting and design. The Wassermans are also considering other ways to use living walls in their business. In the future, they may offer planted walls on wheels as scenery for weddings. These products, called LiveScreens, provide a rentable floral display that can be transported to and from venues for instant, beautiful backdrops. 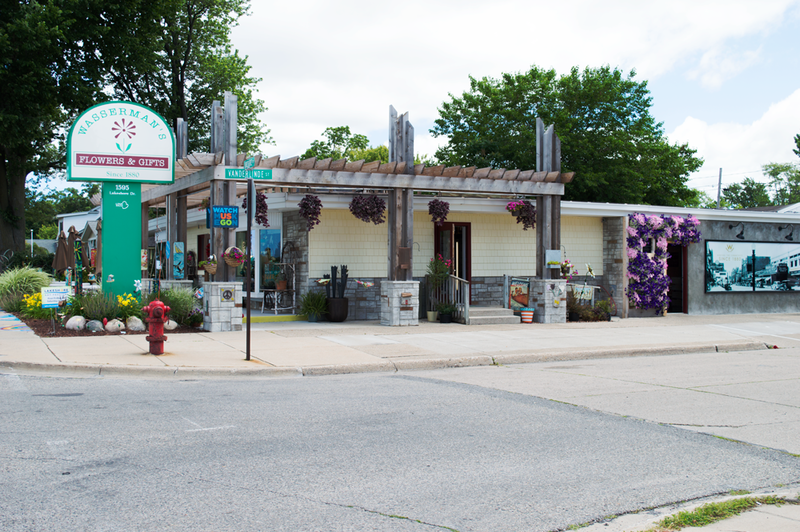 Wasserman’s Flower and Gift Shop is one of the first businesses encountered traveling southwest on Lakeshore Drive. The owners are very passionate about their community, and excited to bring more people to the neighborhood. 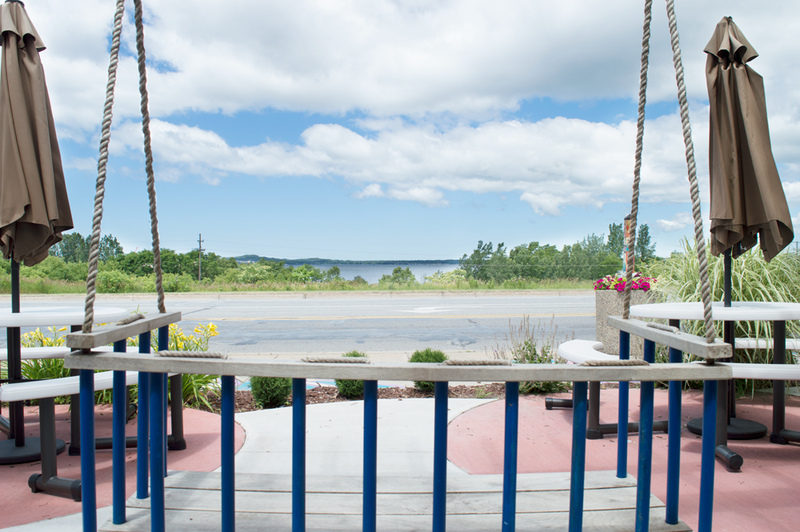 “We want this to be a place where tourists and people living in the community stop in to enjoy the beautiful view of Muskegon Lake. We hope for more people to just drop by and do a little work on their lap top under an umbrella or read a book on the swing of our patio,” he added. Wasserman’s Flowers & Gifts also has seven upcoming Tuesday patio nights, which have free music, great atmosphere and good food. Guests may bring their own beverages or purchase Tex-Mex and BBQ from Bone Ends or select Ice Box brand ice creams and specialty sodas from Wasserman’s. Food Truck Tuesdays are held from 4PM to 8:30 PM on July 5, 19, 26 and August 9, 16, 23 and 30 at 1595 Lakeshore Drive, Muskegon, Mich.
Wasserman's Flowers & Gifts has proudly been serving the Muskegon area since 1880. Wasserman’s is Muskegon's oldest family owned business, and the oldest business in Muskegon. Five generations have taken care of Muskegon's floral needs for 136 years through dedication to customer satisfaction and outstanding service. The shop offers an enormous selection of the freshest and highest quality cut flowers, a very large assortment of beautiful roses, excellent blooming plants, foliage plants and planters. Tropical flowers are shipped direct from Hawaii and are always available. Fifth generation owners and managers Angie and Troy Wasserman were named young florists of the year by the Michigan Floral Association and were recognized by the Muskegon Lakeshore Chamber of Commerce recognized as Agents of Change and as finalists for this year’s Muskegon Lakeshore Chamber of Commerce Entrepreneurs of Excellence. Wasserman’s also received The Celebrated Service award from Jack Loeks Theaters and is featured before every single movie played at The Cinema Carousel and the Plaza Theaters in Muskegon. Designed with a healthy regard for plants, LiveWall® is the patented living wall system that achieves simplicity and sustainability in harmony with nature. LiveWall is the result of four years of R&D by the professionals who created LiveRoof®, the superior green roof system. LiveWall green wall solutions are engineered with horticultural and structural features specific for indoor and outdoor environments. LiveWall supports plants as nature intended — roots growing down, stems and leaves growing up. With unsurpassed versatility to grow a diversity of plant types, LiveWall transforms ordinary walls into inspiring, thriving vertical landscapes that are simple to install and easy to maintain. For more information, call 877-554-4065.